​The chances of a hurricane flooding parts of Texas, like Harvey did, have soared six-fold in just 25 years because of global warming and will likely triple once again before the end of the century, a new study says. The chances of a hurricane flooding parts of Texas, like Harvey did, have soared six-fold in just 25 years because of global warming and will likely triple once again before the end of the century, a new study says. 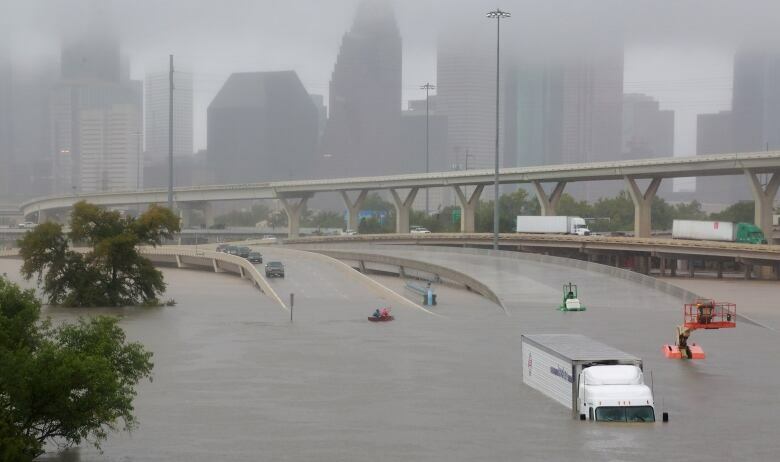 Study author Kerry Emanuel, a meteorology professor and hurricane expert at the Massachusetts Institute of Technology, found that what was once an extremely rare event — 50 centimetres rain over a large area of Texas — could soon be almost common. 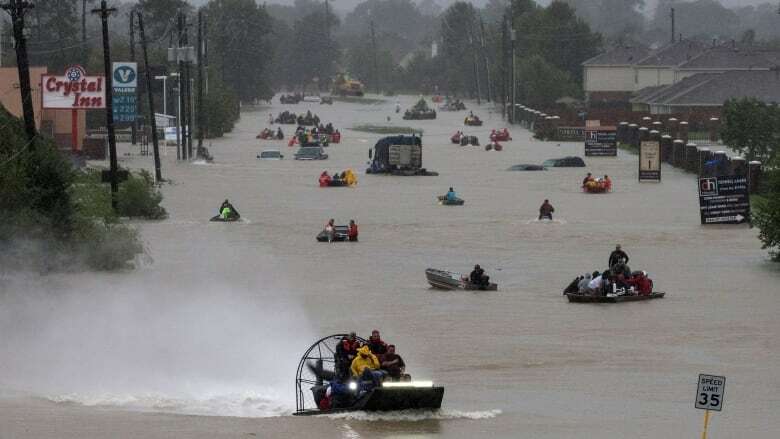 From 1981 to 2000, the probability of 50 centimetres of rain happening somewhere over a large chunk of Texas was 1 in 100 or even less, Emanuel said. Now it's 6 in 100 and by 2081, those odds will be 18 in 100, he said. "The changes in probabilities are because of global warming," Emanuel said. Texas state climatologist John Nielsen-Gammon said he was struck by the potential for much higher rainfall that Emanuel's simulations predict for the future and how important it is for the design of critical structures like dams and nuclear facilities. "If the worst-case precipitation scenario is getting worse, as Kerry's study and other evidence implies, that safety margin is shrinking," Nielsen-Gammon said in an email, highlighting Emanuel's results that also show the worst-case storms becoming wetter and more common. Gabriel Vecchi, a climate scientist at Princeton who wasn't part of the study, said the study confirms what scientists have already thought: "that the most extreme rainfall events will become more likely as the planet warms." "These results highlight the importance of finding ways to incorporate our understanding of climate change in long-term urban planning, storm water management and in flood mapping," Vecchi said in an email. To do the study Emanuel had to use some innovative modelling techniques. Global climate models used for future warming studies aren't detailed enough to simulate hurricanes. Hurricane models don't say anything about the larger climate. So Emanuel combined the models and then created thousands and thousands of fictional storm "seedlings" to see what would happen. Emanuel's calculations used the half-metre rainfall total because that was the initial figure discussed as the storm was dying down. Later measurements showed that Harvey's rain was far heavier — and far rarer — than initially reported. After Emanuel had started his work, records showed Harvey's Houston-wide rainfall ended up closer to 84 centimetres. And in individual areas pit peaked at 1.5 metres. Emanuel called those numbers "Biblical." 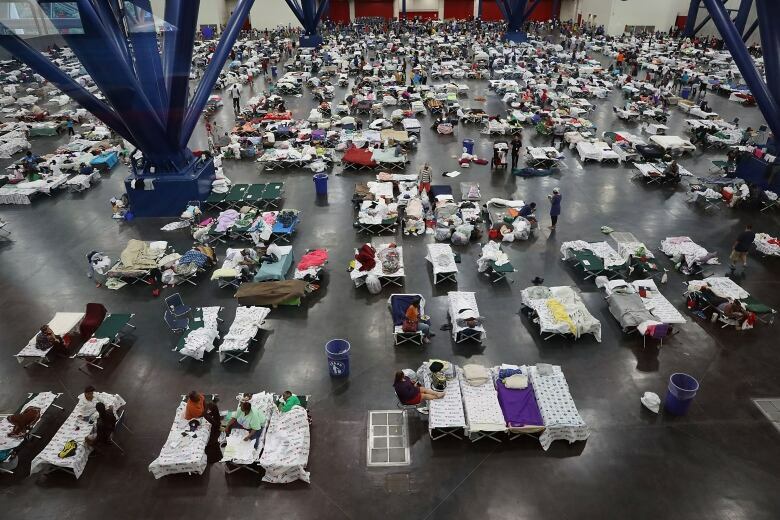 People take shelter at the George R. Brown Convention Center after flood waters from Hurricane Harvey inundated Houston, Texas, on Tuesday. "By the standards of the average climate during 1981–2000, Harvey's rainfall in Houston was 'biblical' in the sense that it likely occurred around once since the Old Testament was written," Emanuel's study said. While several scientists praised the study's technique, Christopher Landsea, science operations chief at the National Hurricane Center, had some reservations. He said Emanuel's results don't fit with other climate change model projections which do show higher rainfall totals but also show a decrease in the number of storms.